Last Days of Earth’s History? In 1971 I started studying prophecy, more specifically the books of Daniel and Revelation and their relationships to each other. In ’79 I finished making thirty-four charts illustrating the Seventh-day Adventist view of these prophecies. This view teaches that most of these prophecies have been fulfilled down through the centuries starting with Nebuchadnezzar the ruler of Babylon. Examples in Daniel show that most of Daniel 8 and all of 9 have been fulfilled, with the 2300 years completed in 1844. In Daniel 11, verses 1 through 39 are fulfilled and verses 40-45 are yet future with verse 12:1, etc. Examples in Revelation teach that six of the seven churches are fulfilled and the seventh is in process of fulfillment; six of the seven seals, fulfilled; six of the seven trumpets, fulfilled; chapter 10 fulfilled around the time of 1844; the first beast of Revelation 13 fulfilled, the second beast is yet future, etc. It was at this time, as I was reading the SDA Bible Commentary, volume 7a, that I read four statements which showed me that there is to be a very specific repeating of prophecy in the last-day events. I studied these prophecies more closely in Scripture and found that it was true. I then made appointments to visit with some leading teachers of prophecy to see what they would say about what I found. To my amazement, all the men I talked with encouraged me, stating that they were aware that prophetic history would be repeated as last-day events. A few of them pointed me in certain directions so that I would “see the whole picture.” One teacher showed me the meaning of the transgression–abomination of desolation and told me that what Jesus taught to the disciples in Matthew 24 is the foundation of repeated prophecy for the last generation. 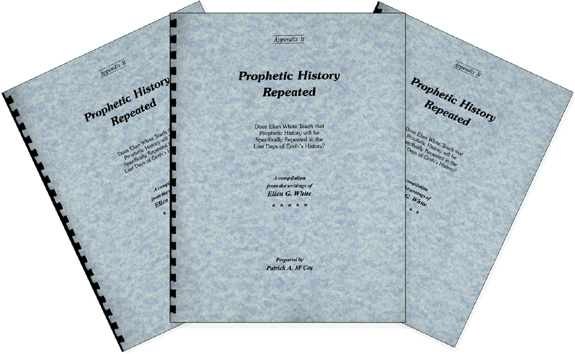 And so, the book above, Prophetic History Repeated, is the result of many years of collecting Bible texts and EGW statements dealing with repeated prophetic history in the last days. It is called Appendix B because it is part of a larger book in the process of being written.